What is Combigan Eye Drops (Brimonidine Tartrate/Timolol Maleate) used for? 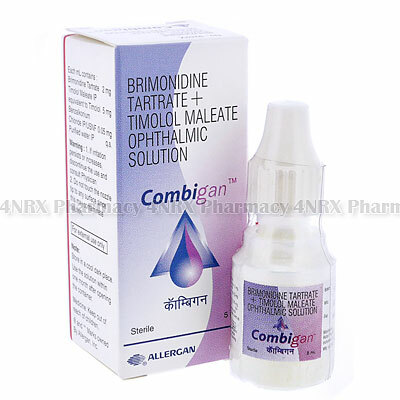 Combigan Eye Drops (Bimonidine Tartrate/Timolol Maleate) is an ophthalmic medication prescribed to treat patients who are suffering from open angle glaucoma or ocular hypertension. It operates by increasing the drainage of fluid from the eye to reduce pressure preventing potential symptoms such as pain, loss of vision, or damage to the optic nerve. It may also be applied to the eyelashes using a special applicator to increase their length and fullness. Your doctor may prescribe the use of this medication for the treatment of other unlisted conditions, as well. How should I use Combigan Eye Drops (Brimonidine Tartrate/Timolol Maleate)? Always use Combigan Eye Drops (Brimonidine Tartrate/Timolol Maleate) as directed by your doctor to ensure the safest and most effective results. One daily administration is normally administered each day, but your individual instructions will depend on your current health, the condition being treated, and the severity of your symptoms. To administer the medication gently shake the bottle to mix its contents, tilt your head back slightly, pull down the lower lid of the eye being treated, and dispense one drop into the pouch that is formed. Slowly close the eyelid to spread the medication and leave it closed for thirty seconds to allow it to be absorbed into the eye. Always observe the medication prior to use to avoid destroying or altering the effects of their contents. Ask your pharmacist or doctor any questions you have about using the medicine to ensure the correct administration. What are the side effects of Combigan Eye Drops (Brimonidine Tartrate/Timolol Maleate)? Serious side effects that may require emergency medical attention are increased sensitivity to light, discharge from the eye, severely impaired vision, or severe pain or irritation of the eye. Tell your doctor as soon as you experience any intense or worrying side effects to make sure the necessary changes are made to your dosage or application frequency to prevent further health complications from occurring. Combigan Eye Drops (Bimonidine Tartrate/Timolol Maleate) should not be used by patients who are breastfeeding, pregnant, or under the age of eighteen. Also inform your doctor if you have hypotension, asthma, closed angle glaucoma, congenital glaucoma, neovascular glaucoma, congenital glaucoma, no lens in the eye, artificial lens in the eye, diabetic retinopathy, inflammation of the eye, reduced liver function, or reduced kidney function. These conditions may cause unexpected health complications requiring adjustments to your regimen. Always remove your contact lenses before using this medication. Strictly use Combigan Eye Drops (Bimonidine Tartrate/Timolol Maleate) as prescribed and follow all instructions provided by your doctor. Safe, suitable, and optimum dosage can vary and is dependent on the patient`s health and medical history, as well as the condition you are treating. Combigan Eye Drops (Bimonidine Tartrate/Timolol Maleate) may not be safe or suitable for all patients. Always ensure your doctor is informed if you are pregnant or breastfeeding, using any other type of medication (including non-prescription medicine, vitamins, and supplements), as well as if you have any allergies, other illnesses, or pre-existing medication conditions.